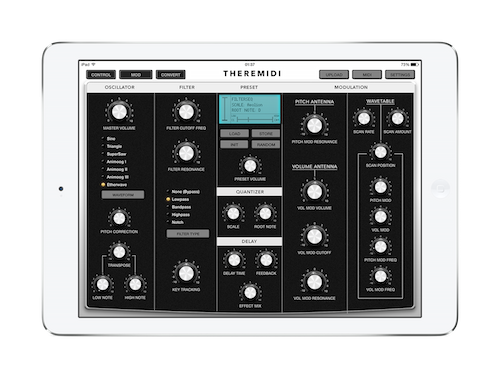 Numerical Audio has announced the launch of ThereMIDI, a new iPad app for the Moog Theremini Theremin. ThereMIDI combines a patch editor/librarian, MIDI controller, and MIDI converter into 1 convenient package. ThereMIDI allows direct access to all of the Theremini's available MIDI parameters, preset management, randomization and more. Patches can be stored on the iPad or uploaded to the Theremini. As a realtime controller, ThereMIDI comes with a built-in 16 step modulation sequencer that works on a variety of targets including filter cutoff, resonance an type, even sequencing pitch is possible. In the MIDI converter mode, ThereMIDI converts CC data into MIDI notes making it possible to use the Theremini to play other synths. A built-in quantizer makes playing fun and easy to learn, users can choose from a variety of scales. ThereMIDI is currently available at an introductory price of $4.99. It will normally sell for $8.99 after that.